This artist's impression shows the huge exoplanet Fomalhaut b orbiting its sun, Fomalhaut. An enormous alien planet that some astronomers thought was dead and buried has come back to life, a new study suggests. A new analysis of observations from NASA's Hubble Space Telescope found that the bright nearby star Fomalhaut does indeed host a huge exoplanet, which scientists dubbed a "zombie" world in an aptly Halloween-themed video on the alien planet. This conclusion contradicts other recent studies, which determined that the so-called planet — known as Fomalhaut b — is actually just a giant dust cloud. 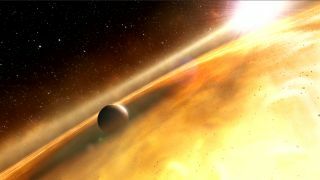 "Given what we know about the behavior of dust and the environment where the planet is located, we think that we're seeing a planetary object that is completely embedded in dust rather than a free-floating dust cloud," co-author John Debes, of the Space Telescope Science Institute in Baltimore, said in a statement. The saga of Fomalhaut b began in November 2008, when Hubble astronomers announced that a planet circled Fomalhaut, which lies 25 light-years away in the constellation Piscis Austrinus. Fomalhaut b was the first alien world ever directly imaged in visible light, they said. But other scientists subsequently cast doubt on Fomalhaut b's existence. Some have argued that the object is just a short-lived dust cloud, citing the brightness variations reported by the discovery team and the fact that NASA's Spitzer Space Telescope has been unable to pick up its infrared signature. The doubters also pointed to Fomalhaut b's apparent motion, saying it was moving in an orbit too fast and out of line with the debris disk to have sculpted it. But the new study detects the planet all over again, in a fresh analysis of Hubble observations from 2004 and 2006. The research team spotted Fomalhaut b in three different wavelengths of visible light. The astronomers did not detect any brightness variations this time around, further bolstering Fomalhaut b's planethood case. "Although our results seriously challenge the original discovery paper, they do so in a way that actually makes the object's interpretation much cleaner and leaves intact the core conclusion — that Fomalhaut b is indeed a massive planet," said lead author Thayne Currie, an astronomer formerly at NASA's Goddard Space Flight Center in Greenbelt, Md., and now at the University of Toronto. The new study also pins down Fomalhaut b's orbital characteristics, finding that the planet's gravity could indeed be shaping the debris disk, researchers said. "What we've seen from our analysis is that the object's minimum distance from the disk has hardly changed at all in two years, which is a good sign that it's in a nice ring-sculpting orbit," said co-author Timothy Rodigas of the University of Arizona. The team also attempted to spot Fomalhaut b in the infrared using Hawaii's Subaru Telescope but came up empty. The non-detections with Subaru and Spitzer imply that the planet's mass must be less than twice that of Jupiter, researchers said. The study has been accepted for publication in The Astrophysical Journal Letters. Another team targeted the Fomalhaut system with Hubble in May; their results are expected to be published soon.